In many circumstances, photographers need to work in the field but still need the performance of an infrastructure network. Since conventional access points and routers need A/C power to function, they aren't suitable for use when movement is required. Unfortunately, switching to ad-hoc mode significantly reduces the available bandwidth, and with the large file sizes generated by high-end DSLRs this can be a major caveat. 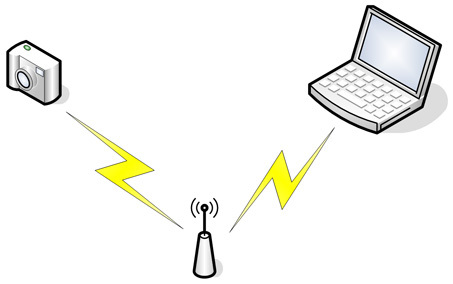 Fortunately, there are a number of products that can act as access points and draw their power from the laptop directly. D-Link's Pocket Router (DWL-G730AP) is a conventional access point, however it comes with an adapter that allows it to use a free USB port on your laptop to provide power. Alternately, ZyXel offers their G-220 and AG-225H adapters which have a SoftAP mode that allow them to emmulate an access point. All of these offerings will allow you to opperate your transmitter at full 802.11g speeds and aren't dependant on anything outside of your laptop.